If you live in Minnesota, you may have recently come across a savvy-looking campaign in defense of “pipeline infrastructure” and “energy needs” in the state. It’s called “Modernizing Minnesota,” and it’s backed by a group known as the Consumer Energy Alliance (CEA). The big cause that the CEA is pushing in Minnesota – though two ads during this year’s Emmy awards, for example – is Enbridge’s Line 3 pipeline, which if approved and built, would ship hundreds of thousands of barrels of Tar Sands crude oil per day across the state. Line 3 has sparked intense controversy in Minnesota, leading to widespread opposition – not just among environmentalists and indigenous groups, but even from the state’s own Department of Commerce. No wonder, then, that the CEA is amping up its efforts on behalf of the pipeline. But for concerned Minnesotans wondering who and what this “Consumer Energy Alliance” really is, it’s anything but a “consumer” organization. Far from a grassroots group, the CEA is actually a PR effort funded largely by the fossil fuel industry and run by a Houston-based consulting and lobbying firm. Indeed, the CEA’s “Modernizing Minnesota” go-to contact doesn’t even live in the state. As we reported back in May, the CEA, which labels itself “the voice of the energy consumer,” is actually an oil and gas industry-backed marketing effort driven by corporate powerhouses that aims to shape public opinion to advance fossil fuel interests. CEA throws its marketing apparatus behind efforts to roll back environmental regulations, advance offshore drilling, fracking, and pipeline construction, and attack environmental activists. Its board members include representatives from industries that stand to profit off of pipelines, and the board’s vice-chair comes from the Virginia Manufacturers Association, a big supporter of the proposed Atlantic Coast Pipeline. Even more, CEA hardly exists as a real group – it’s more a series of websites, press releases, and photo-ops run by a well-paid consulting and lobbying firm based in Houston called HBW Resources. CEA’s regional “leaders” – like Chris Ventura, the Executive Director for Consumer Energy Alliance – Midwest, who’s quoted in “Modernizing Minnesota” press releases – are actually just HBW executives and consultants. CEA’s president, David Holt, is the co-founder of HBW, and he’s used CEA to rake in big money to his consulting firm – around $5 million over the past half-decade alone. To recap: far from any kind of bottom-up mobilization, CEA is a strikingly top-down PR campaign being carried out by well-compensated consultants backed by fossil fuel money. HBW Resources is also no stranger to the world of revolving door lobbyists and paid-for corporate influence in government. It employs a lobbyist, Michael Zehr, who previously held a number of government positions. He now taps these connections to lobby for the oil and gas industry, and one of his biggest customers is – you guessed it – the CEA. Zehr is HBW’s “Vice President of Federal Affairs” – AKA, its main DC lobbyist. Before joining HBW in 2011, Zehr served as a Legislative Assistant or Legislative Director for four different US Senators – Tim Hutchinson (Arkansas), Mitch McConnell (Kentucky), Mel Martinez (Florida), and George Lemieux (Florida) – from 1999 to 2010. National Ocean Policy Coalition, a fossil fuel-backed group, to “support greater transparency for the funding and implementation of the the National Ocean Policy to ensure that all ocean users are involved in effort to change the way ocean resources are regulated and utilized” – a euphemistic description for lobbying for oil and gas interests towards ocean policy. But one of Zehr’s and HBW’s biggest customers has been the CEA. From 2012 to 2017, the CEA has paid HBW a whopping $870,000 to lobby the government on behalf of fossil fuel interests. A 2016 filing, for example, stats that Zehr lobbied for “offshore oil and gas development, onshore oil and gas development, hydraulic fracturing, and federal lands,” while a 2015 filing shows that he also lobbied for the Keystone XL pipeline. In sum, CEA has paid HBW Resources hundreds of thousands of dollars to lobby for fossil fuel interests since 2012, while HBW also wages the CEA’s astroturf PR campaign for those same oil and gas interests. It’s also worth noting that CEA’s “Modernizing Minnesota” webpage cites a University of Minnesota Duluth (UMD) study that claims Line 3 will create 8,600 jobs. What it doesn’t tell you is that Enbridge provided the data inputs for this study and also funds the entity that commissioned it from UMD. The CEA’s “Modernizing Minnesota” is part of its “Advocacy Across America” effort that consists of a range of campaigns with a more local and/or particular focus. 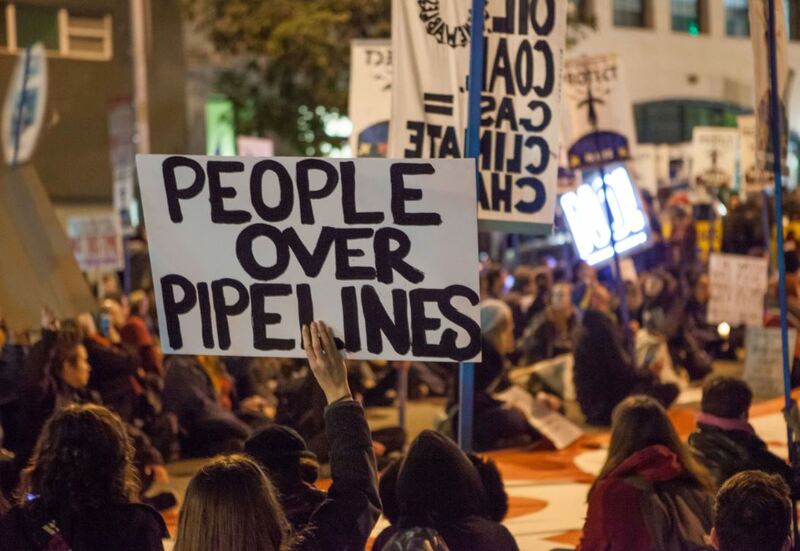 New England, the southeast, and Minnesota – coincidentally, all places with major pipeline projects being debated – have been targets of specific CEA initiatives. The “Campaign for American Energy” has a special focus on Appalachia and the southeast, including Virginia and North Carolina, both states that are hotly debating the proposed Atlantic Coast Pipeline. To be sure, the CEA isn’t unique when it comes to these kinds of top-down, fossil fuel-backed marketing campaigns. For example, a Washington Post exposé published last week revealed the stunning extent of the corporate public relations campaign that Dominion Energy, the powerful Virginia-based utilities behemoth, is waging to promote the Atlantic Coast Pipeline, in which it has a 48% stake. The article showed how Dominion has used “online groups” with names like “EnergySure” and “Your Energy Virginia” to conduct a top-down “campaign to elect a pipeline” that poses as a grassroots effort. Marketing campaigns like this and the CEA’s are proof that the fossil fuel industry isn’t taking any chances when it comes to expanding oil and gas pipeline infrastructure. This makes it all the more important for the public to know who and what is really behind the PR efforts of groups like the CEA. >> The article above was written by Derek Seidman, and is reprinted from Eye on the Ties.